The festive season is upon us and today I thought I will share with you my take on Indian Wear and accessories for this Diwali. 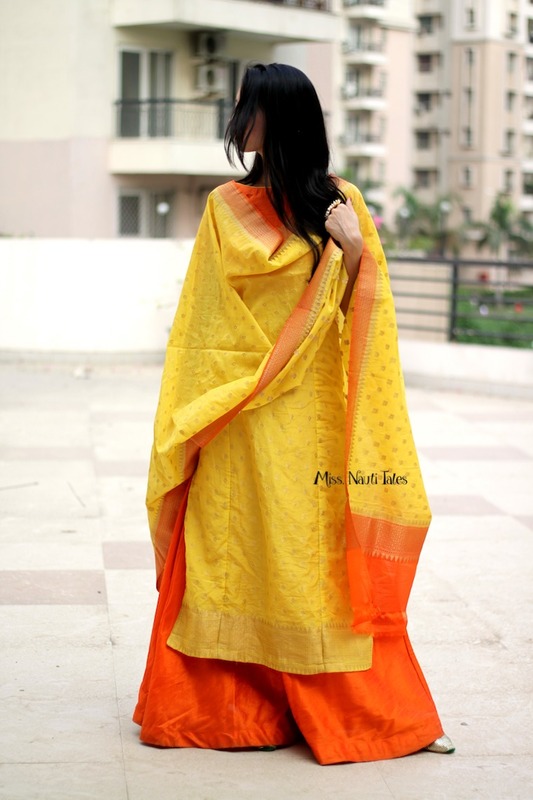 The festival stands for color, lights, happiness, and love and for me a beautiful yellow banarasi outfit with Urban Gota accessories was the perfect pick to resonate just that. My mum in law had gifted me this beautiful fabric during my wedding and for the longest time, I wondered how to style it. That’s the time when Urban Gota reached out to me sharing their beautiful gota accessories. The moment I saw the fun colours, I just knew my look was complete with it. I wanted to showcase the rich colours of the outfit with the poppy contrast accessories. I chose to wear the urban gota pom-pom bangles and a big statement gota ring to go with it. A dash of red bindi completed the entire look. I previously had the pop orange raw silk skirt from another outfit, so I decided to team it up with the banarasi kurta. What is the brand Urban Gota all about? Urban Gota is run by a mother-daughter duo. Their brand has a wide range of accessories that are perfect for affordable gifting, wedding favours and also to own yourself. My favourite from their collection are the beautiful shagun envelopes, gota rings, and colourful pom-pom clutches. How to buy these Urban Gota accessories? How much do Urban Gota accessories cost? Which accessory from Urban Gota did you love the most?